In 1940, Dale Messick’s newspaper comic strip Brenda Starr: Reporter debuted, telling the adventures of an intrepid and glamorous investigative journalist. It would run for several decades, showcasing not only exciting plot lines, but also the changing face of fashion and culture during its run. 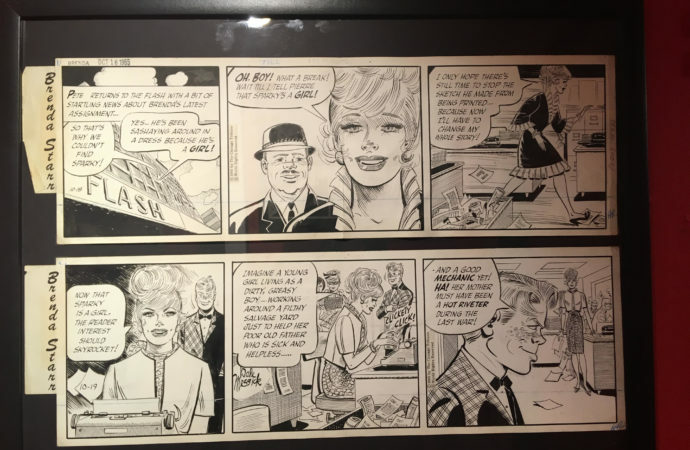 A new exhibit of Brenda Starr strips at the Society of Illustrators’ Museum of Illustration showcases one specific plotline in the newspaper strip, from the 1960s. Though small in scale and narrow in focus, it is a joy to visit. 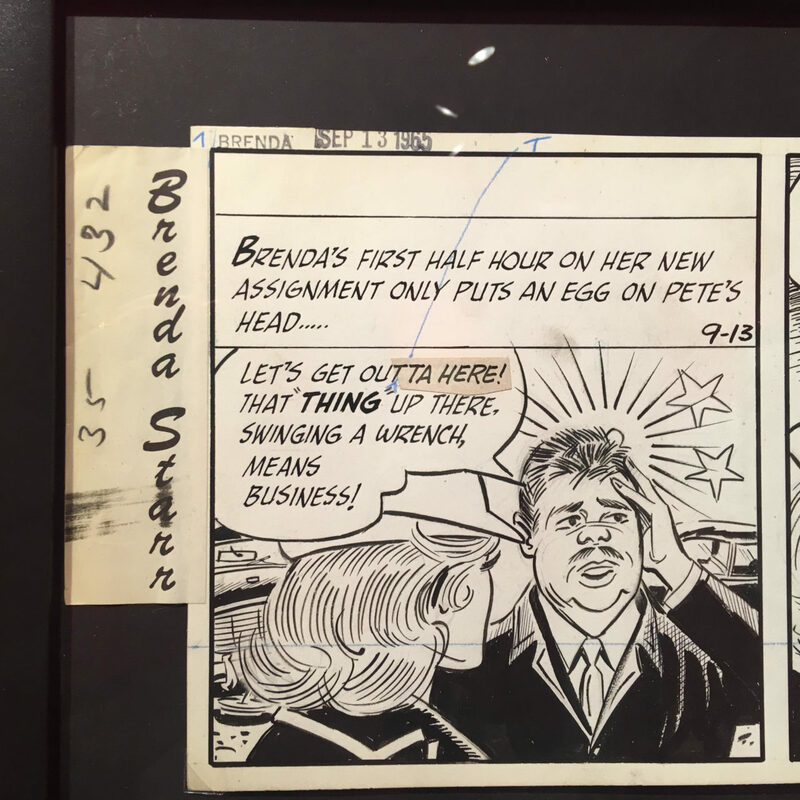 The Museum of Illustration offers three exhibits right now, of which “Brenda Starr: Reporter: The Art of Dale Messick” is by far the smallest. 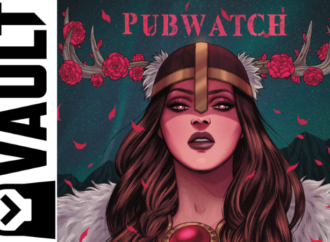 The ground floor and lower level together make up “Illustrators 61,” the annual exhibit of celebrated work by the Society of Illustrators’ members. The third floor, which is the Society’s restaurant and bar, has its walls decorated with “Excelsior! 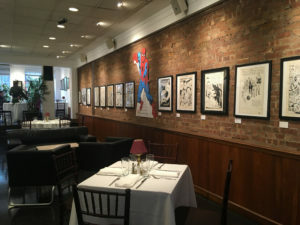 : The World of Stan Lee.” Compared to these, the exhibit of Messick’s work on the second floor is very small, just one single hallway. The first wall text you see when you come up the stairs to enter the Dale Messick exhibit at the Society of Illustrators. 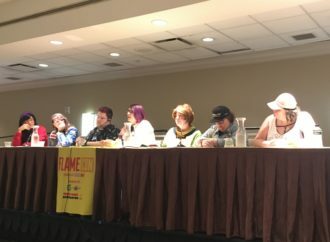 This is not to the exhibit’s detriment, however, since it does not purport to be comprehensive of the strip’s multi-decade run. 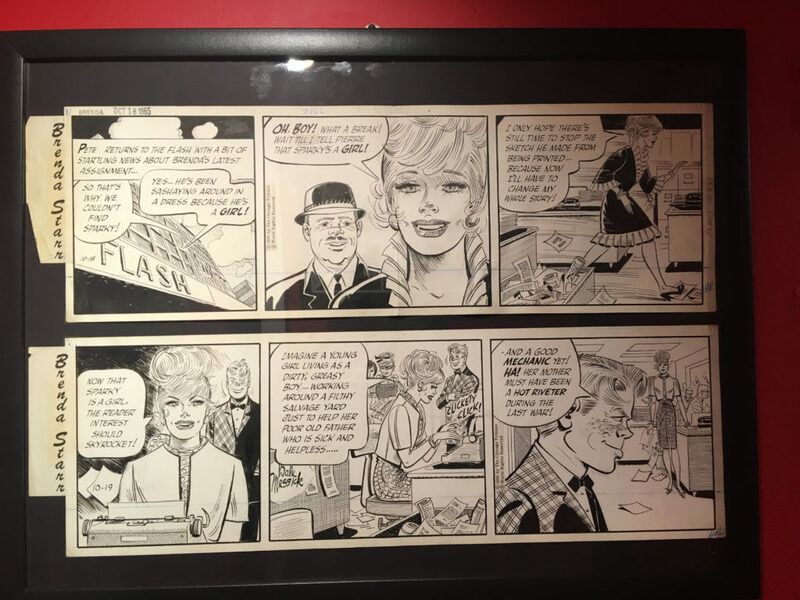 Rather, walking the length of the hallway offers a few unrelated strips from the 1960s and a couple from the 1940s at the edges, but mostly a focused and intimate look at the original art for the “Sparky” storyline of Brenda Starr, Reporter from 1965—which wall text informs museum-goers is being adapted for the theater by Dale Messick’s granddaughter, playwright Laura Rohrman. Rohrman co-curated the exhibit, and the strips that make up the “Sparky” storyline come from her personal collection. 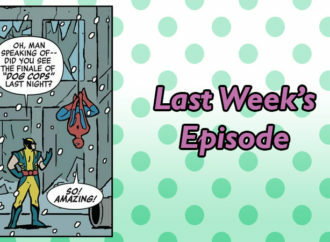 The strips that make up this storyline offer a glimpse into the processes of newspaper production at the time, with their larger scale that would be reduced for reproduction, their editorial paste-overs, blue pencil corrections, and a note on the wall text from Rohrman that Messick would work months in advance. One of my favorite things about visiting the Society of Illustrators that sets it apart from other museum spaces, is that at SI, I can stick my face right up to the glass and get an extremely close look. 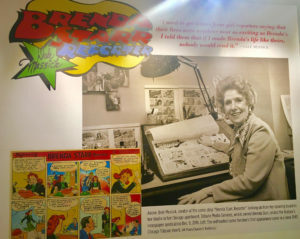 One panel of Brenda Starr: Reporter by Dale Messick, on view at the Society of Illustrators. The “Sparky” story, which ran the last four months of 1965, is a good one. It introduces a father and child in fairly dire straits who attempt to evade the media, but are eventually won over (I’m glossing over a lot here to avoid undue spoilers) by Brenda and her team. It is indicative of the fast pacing and attention to characterization that Messick did so well. 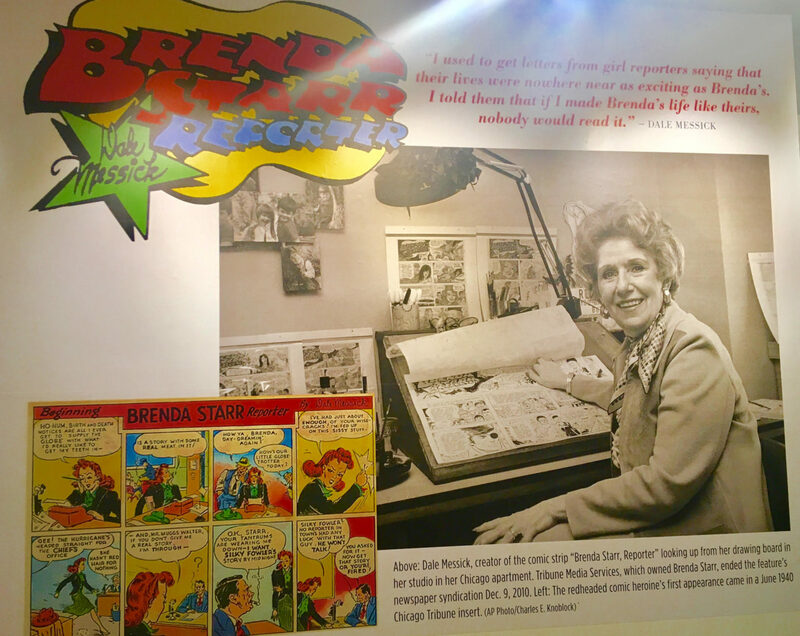 From the title of the exhibit, “Brenda Starr: Reporter: The Art of Dale Messick,” I had expected something more like a chronological overview of how the strip’s image of Brenda changed over the many decades of its run. I enjoyed what this exhibit actually is, but I’d like to see that one some time, too. It would need more space than a hallway. I recommend this exhibit with one caveat: the Society of Illustrators’ Museum of Illustration does not have an elevator. If you use a wheelchair or have mobility issues of other kinds, the lower level, the second and third floors, and part of the ground floor will all be inaccessible to you. 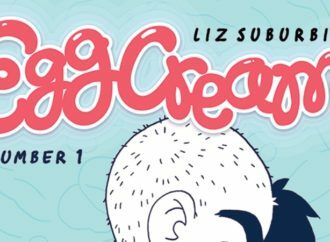 Assuming access is possible, this is a good time to visit the Society of Illustrators because all three exhibits are quite strong. The Annual is varied in style and media, with a number of three dimensional pieces in addition to the expected digital and traditional work on the walls. 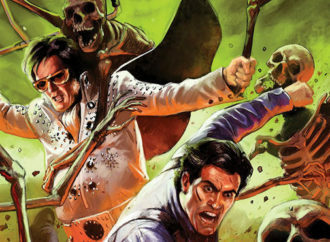 The “World of Stan Lee” exhibit offers pages and covers from comic books that feature Lee’s co-created characters, mostly from the 1960s and 1970s, not all of which are scripted by Lee, but all of which are interesting. 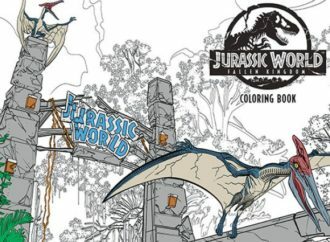 The Annual, “Illustrators 61” will switch focus in early February and then run through March 9th. 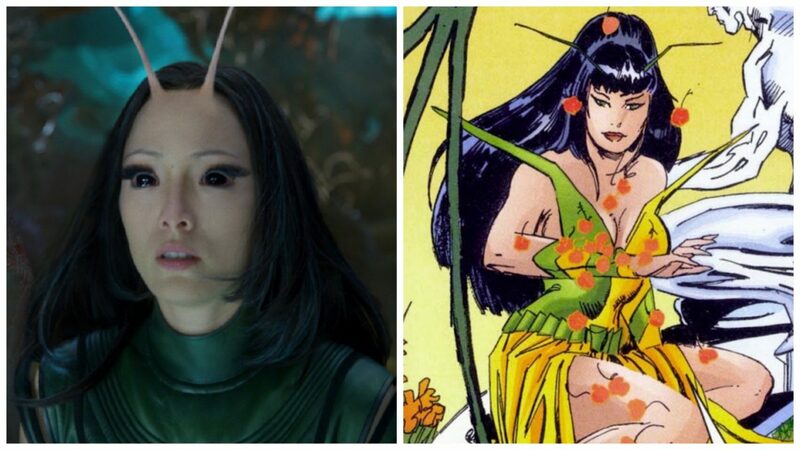 “Excelsior! 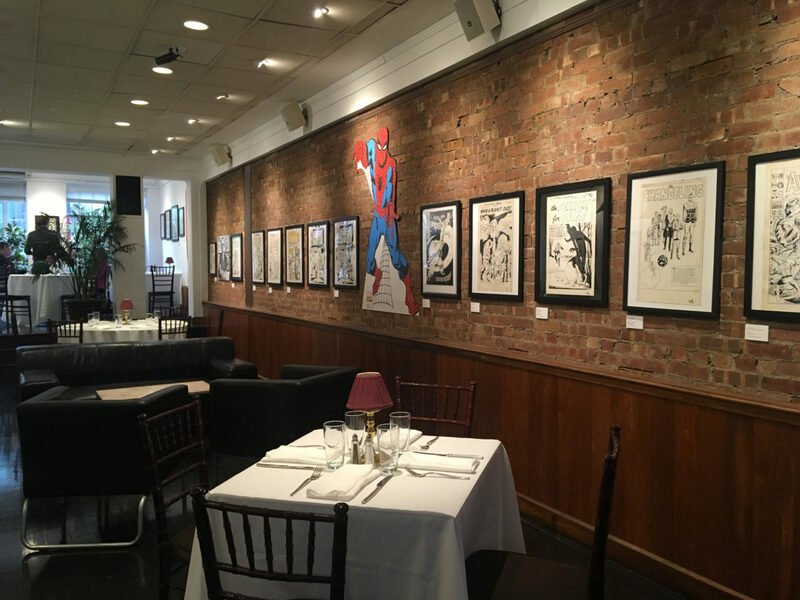 : The World of Stan Lee” will run through March 2nd, and “Brenda Starr: Reporter: The Art of Dale Messick” will run through March 23rd.